This application helps you to convert your videos into a different format. Depending on the format of your original videos, streaming the files with the help of the media server or accessing them from certain UPnP clients (e.g. PS3, Xbox, TV) might not work properly, so you can convert the incompatible files first, before you access them. The video transcoding application is only available on MyCloud models with a more powerful processor (e.g. MyCloud Pro). Start the video transcoding application and click Add. 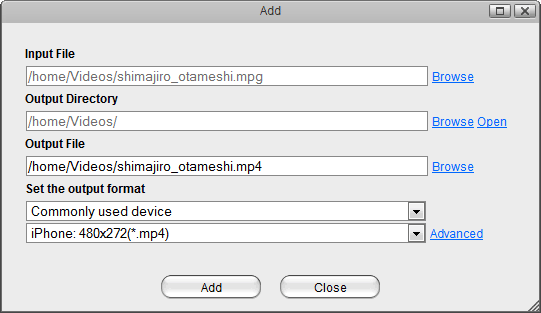 Locate and select the video file that you would like to convert by clicking on Browse beside the input file. If needed, change the output directory and the output file. 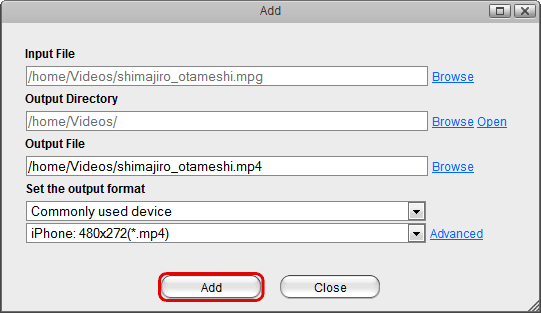 Select your playback device from the list of available presets or click Advanced and define your own format. When you are ready to convert the file, click Add and then close the window. Click Refresh to update the status and see the progress. When the progress has reached 100%, your file is ready.